The new sculpture installation at Lakedale Resort “Embark/Embrace“ is so beautiful. So neat to see the artists at work while this was being installed. 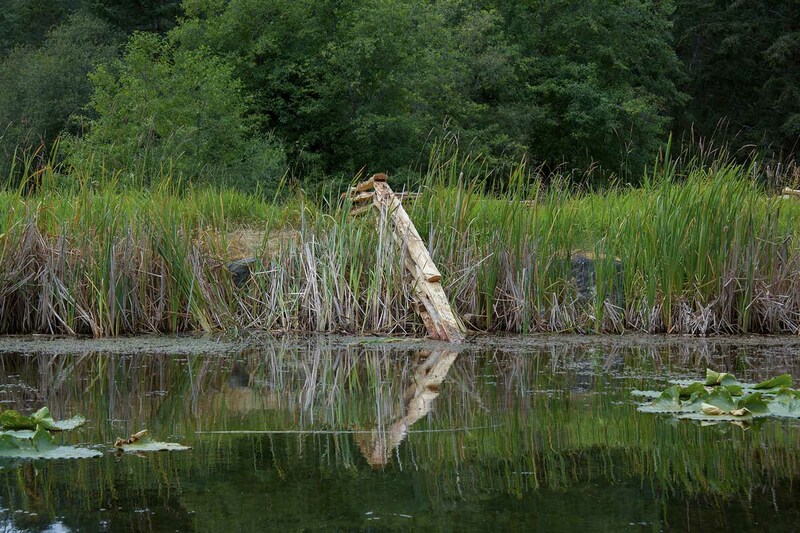 The work begins as a red cedar log felled on its side at the edge of a large body of water. 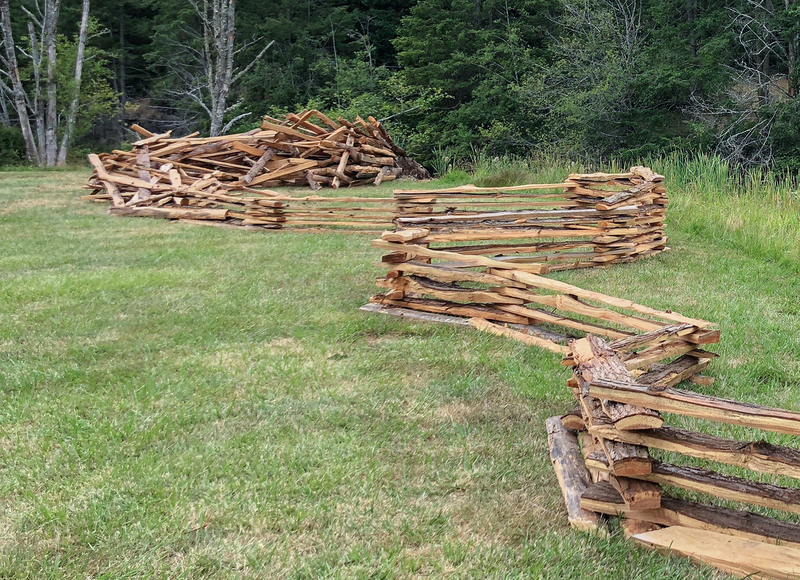 As it extends out from the water, it explodes into large splintering shards of wood that eventually form into a split-rail fence, meandering and arbitrarily dividing land and water. 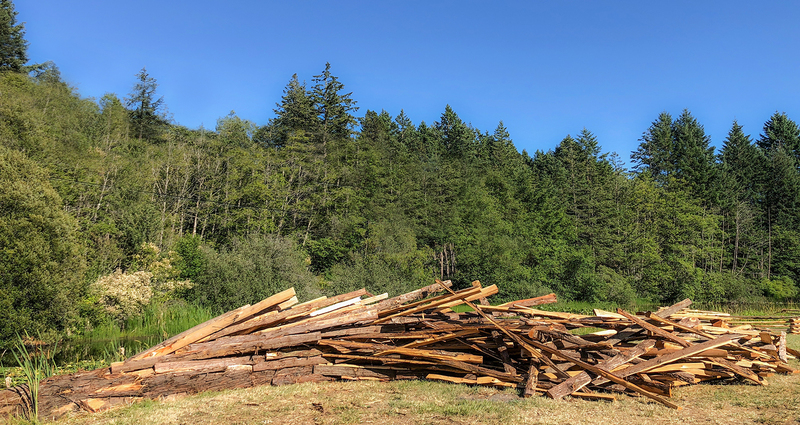 The temporary transformation of the log into a fence will ultimately return to nature overtime. Nature is only contained by nature, not by stewardship and regulation, as humans would prefer. Boundaries are arbitrary, as they signify division of being and existence, rather than pronouncing the universality found in the natural world. Red Cedar is a beneficial habitat for many native creatures, represented by bronze sculptures of salamanders, toads, voles, snails, snakes, turtles and beetles. The small creatures dot the sculptural installation like a treasure hunt where guests can connect with the native ecosystem found there. Guests are also invited to embellish “mushroom cookies” in the Lakedale activity tent and place them into the sculpture in family/friend groupings (onto dowels in pre-drilled holes found at the base of the split-rail fence), further reinforcing the collaborative nature of the piece.